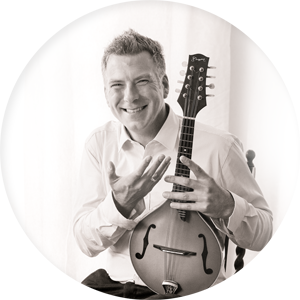 Joel McDermott composes and arranges acoustic instrumental music for guitar and mandolin. He has been playing fretted stringed instruments for more than 30 years, and has performed across the UK at festivals, concerts, weddings and private functions. His compositions and recordings have been played on radio stations around the world. Joel teaches guitar and mandolin from beginner to advanced level in Ilfracombe, NorthDevon. Click here for more information. 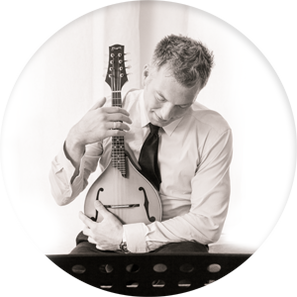 Joel plays romantic solo mandolin and guitar music for weddings and functions in Devon, Cornwall and South West UK. Visit www.lovelyweddingmusic.com for more information. Lessons in Ilfracombe with expert guitar teacher and mandolin teacher Joel McDermott. For beginners to advanced players. debit and credit cards accepted online with Paypal (no account needed). Joel McDermott plays live music for wedding ceremonies and receptions. Solo guitar and/or solo mandolin. Large repertorire of ambient background music. A typical wedding ceremony performance includes solo mandolin or guitar music while guests enter the venue, during the bride's arrival and walk up the aisle, signing the register, leaving the venue, and at any other pre-agreed points in the service. Joel will also provide accompaniment for guest singers or other soloists if required. After the ceremony Joel usually moves on to the reception venue and plays for a further 1 – 3 hours during reception, meal, early evening drinks etc. The reception performance usually has a 15 minute interval break. Guitar and mandolin lessons in Ilfracombe, Devon, UK. Credit and debit cards accepted for online payments.